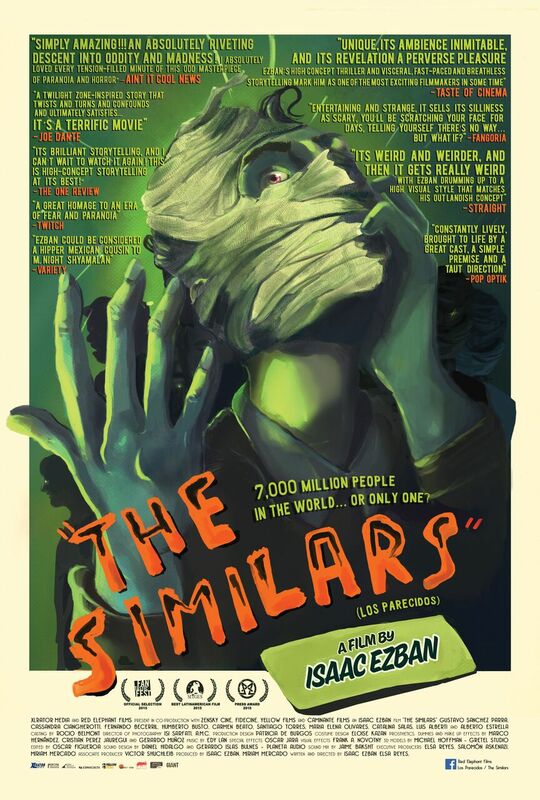 Hey folks, Jesse here, I was just watching a movie called, The Similars (Los Parecidos) on Netflix. It’s a Spanish language 2016 horror blend from director Isaac Ezban. It was heavily reminiscent of an old Twilight Zone episode. It’s a modern version of those old stories and it was even shot to look like something from the late 60s. I enjoyed the style and it was fun to watch what was essentially a rebooted episode of The Twilight Zone. You don’t have to be a fan of Twilight Zone to enjoy so I’ll tell you a little about this movie. The Similars opens in a bus station. Actually, it takes place entirely in a bus station. There is a terrible storm outside that has led all the buses to be canceled, leaving any hopeful passengers stranded. One such passenger is Ulises. He is on his way to the city for the birth of his child. Ulises tries to reach his pregnant wife by pay phone but has little luck with the dangerous storm causing inference. He meets another pregnant woman who is being told by Matin, the ticket booth manager, about the buses being canceled. Disappointed the two decide to share a cab to their destination. They also ask an elderly woman who is in the back of the station but she continuously is babbling in an unknown and seemingly incoherent language. Another man arrives as does a woman with her sickly son. Ulises manages to get a call through and finds out his wife died during childbirth. He only has moments to be devastated as the rest of the people in the bus station start having unexplained seizures. Martin emerges with his face completely covered by bandages. Underneath those bandages, it is revealed that Martin’s face has changed into Ulises’ face! Everyone is dismayed and begin looking to Ulises and demanding answers. Ulises is stunned as much as everyone and claims to have no idea what is going on. Soon the others begin to make the change and seem to share the same odd affliction. Tensions rise as they struggle to find the meaning behind it all. I’ll stop there so not to spoil anything that happens after that. The movie has some pretty gruesome scenes and can actually be quite unsettling at times. Practical effects are used when creating multiple versions of the same character. This is especially fitting since it has the look and feel of a movie from the 60s. The colors are desaturated to the point of being near black and white. The bus station set is perfect and captures the essence of simpler times with pay phones and nothing automated in sight. While doing that, it also becomes an inescapable nightmare setting where all you can do is pull a door handle that will never open. I didn’t find that the movie was making much of statement or had some deeper meaning. If it was meant to I couldn’t tell. I think it was just meant to be a fun experiment in filmmaking. The actors seemed to be “overacting” but I think this was done on purpose to give it that same over the top acting sometimes seen in The Twilight Zone (I’m looking at you, Shatner). The movie is not taking itself seriously but some of the ideas came off disturbing and gory enough to surpass the old standards of The Twilight Zone. The music and score were done well. It had an old sound as well. Lots of blaring trumpets during the scary reveals that can be pretty jarring. I like that they used special effect make up instead of split screening the multiple “similar” characters. It also pays tribute to the horror genre near its roots in a way that it can’t really be called original. It felt more like an entry into a horror anthology than a whole movie. The Similars is a horror movie mostly for fans of the genre. Even then, if you only enjoy mainstream scary movies maybe this won’t be your cup of tea. Everything is explained by the end and it wasn’t what I was expecting. I’m not sure if that’s a good or bad thing but I know that I overall enjoyed watching it. That’s it for now. Go check this movie out on Netflix and give it a chance. It’s weird and experimental but it might bring back some nostalgia for the older horror fans out there. Stick around, I’ll be taking a look at more movies and I want to tell about those ones too.